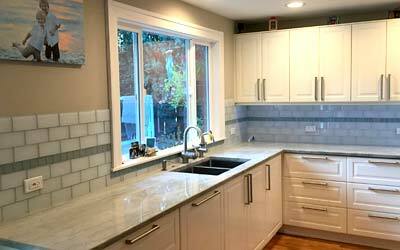 "Miguel and his crew from Natural Stoneworks brought my kitchen to life! They installed granite countertops in my kitchen. The job turned out perfect, on time and great quality for the price! Would recommend to anyone interested in granite countertop. Not afraid to go out of his way to make the customer happy. Thank you!!" — K. Butler ˜ Seattle WA. 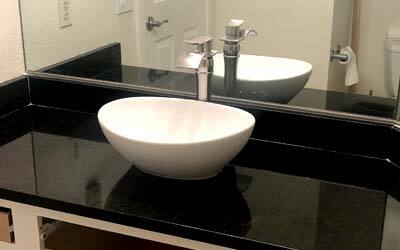 "Miguel installed granite counter tops in our kitchen. The job was done very well and was completed on time as promised. Miguel is very honest and hard working. I have no hesitation in recommending Miguel and Natural Stoneworks. — M. Anderson ˜ Bellevue WA. "Natural Stonewords replaced granite on our kitchen island [9' x 4']. Repaired and refinished tile in entryway [7' x 7']. Prompt service, great workmanship, great price, exactly as estimated. Very professional and pleasant. — Will ˜ Seattle WA. 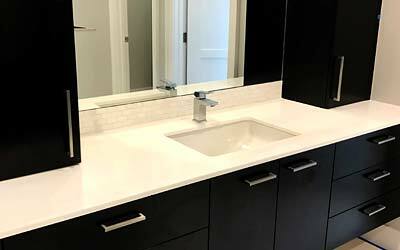 "Hello this is Eric I'm a general contractor and natural stoneworks works as a subcontractor I'm so happy with their performance in every job that with hire them They just did a custom stone sink bathroom out of limestone material the customer they are impress with the job we will definitely recommend natural stoneworks to any person who ask us about them. Thank you again for the great job! — Eric ˜ Seattle WA.